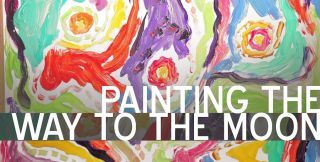 The documentary "Painting the Way to the Moon" explores the uncommon life of artist and scientist Edward Belbruno. Skilled mathematician and passionate painter Ed Belbruno – whose worldview and life experiences differ from what is typically expected of a scientist – is profiled in the new documentary, "Painting the Way to the Moon." In the mid-1980s, Belbruno made an oil pastel drawing that would eventually help him calculate a way to get a stranded Japanese spacecraft from the Earth to the moon. This story is a central part of the new documentary, and it's a good example of the ways that art and science intertwine in Belbruno's life – a life that is both unexpected and sometimes unexplainable. Artist and scientist Ed Belbruno, who is the subject of the documentary "Painting the Way to the Moon." "Painting the Way to the Moon" features interviews with leading astrophysicists who speak highly of Ed Belbruno's scientific work on ballistic orbits (meaning those that use only gravity, rather than fuel, to move around the solar system). It also features an interview with Belbruno's spiritual coach, and a story about a UFO sighting. These disparate bits of evidence are all rounded up in an attempt to answer the question: "Who is Ed Belbruno?" From 1985 to 1990, Ed Belbruno was a mathematician working at NASA's Jet Propulsion Laboratory (JPL). During that time he used what's called chaos dynamics to find a ballistic orbit from the Earth to the moon – one that used only the pull of gravity to loop its way to its destination. Considering the cost of sending fuel to space, and the fact that there are no filling stations in orbit, the theory had great potential to make moon missions safer and cheaper. According to Belbruno, rather than applauding his work, the administration at JPL told him to stop working on ballistic capture. He continued his work, however, and in 1990 the administration cut his funding (akin to getting fired) because the ballistic orbit work went against the laboratory's space program at that time. Devastated by his dismissal from JPL, Belbruno moved to Minneapolis and tried to work as an artist. Ultimately, art couldn't pay the bills and Belbruno returned to science. Before Belbruno left JPL he had the chance to put his ballistic capture ideas into practice, in order to try to get a stranded Japanese spacecraft, called Hiten (originally called MUSES), from the Earth to the moon using a limited fuel supply. Belbruno's personality is as much on display in the film as his scientific and artistic work. Thomas R. McDonough, a friend of Belbruno's and former director of the SETI program, said in the film (with a bit of a laugh) that when Belbruno started getting publicity for his artistically inspired science, "It fed his ego, which is big. But deservedly so, because he was doing really good and interesting work." The life of artist and scientist Edward Belbruno is profiled in the new documentary film, "Painting the Way to the Moon." One of Belbruno's paintings, "Diophantine Flow" (2010), pays homage to his scientific work on spacecraft orbits. Belbruno doesn't shy away from telling strange stories from his life, like the time he says he saw an alien spaceship in the Wyoming desert. He also says that after taking with hallucinogenic drugs when he was 18 (the only time he ever did so, he said), he became a whiz at mathematics, and found he could ace hour-long calculus exams in 20 minutes.The disagreement with Miller also adds a shade of doubt about Belbruno's recollection of events. In the film, Belbruno says he saw an alien spaceship while he was driving through the Wyoming desert with a friend. The sighting occurred on the same night that the Hiten spacecraft arrived at the moon, which Belbruno said he thinks is significant. "I'm not promoting you do that," Belbruno said in the film, referring to the drug experience. "In my case, I think that the magic mushrooms, which is psilocybin […] done carefully, it connects you with the universal, I call it the universal intelligence, the universal energy, the universal God presence. It connects you with that." Neil deGrasse Tyson, director of the Hayden Planetarium in New York City and host of the show "Cosmos: A Spacetime Odyssey," and David Spergel, chair of the astrophysics department at Princeton University, were both featured in the documentary and speak highly of Belbruno and his work. "Don't tell Ed I said this, but I think he might be a little crazy," deGrasse Tyson tells the camera. "But maybe you need to be a little crazy to discover stuff that no one thought was there to notice." Approaching the question "Who is Ed Belbruno?" is not a simple task for director Okada. Belbruno is a man whose story is already somewhat complex (he's a scientist and an artist), and the story seems further complicated by Belbruno's own telling of it. Whoever he is, he makes for a fascinating case study, which Okada approaches with as much journalistic objectivity as may be possible. The result is a fascinating look at a man who is anything but ordinary. Editor's Note: This article was updated to correct the timeline of events that took place while Belbruno was employed at JPL.